Rebecca Kiss/Assistant Photo Editor Redshirt sophomore goalie Kevin Carbone corralled 11 saves on 15 shots in a low-scoring home loss to UMBC. 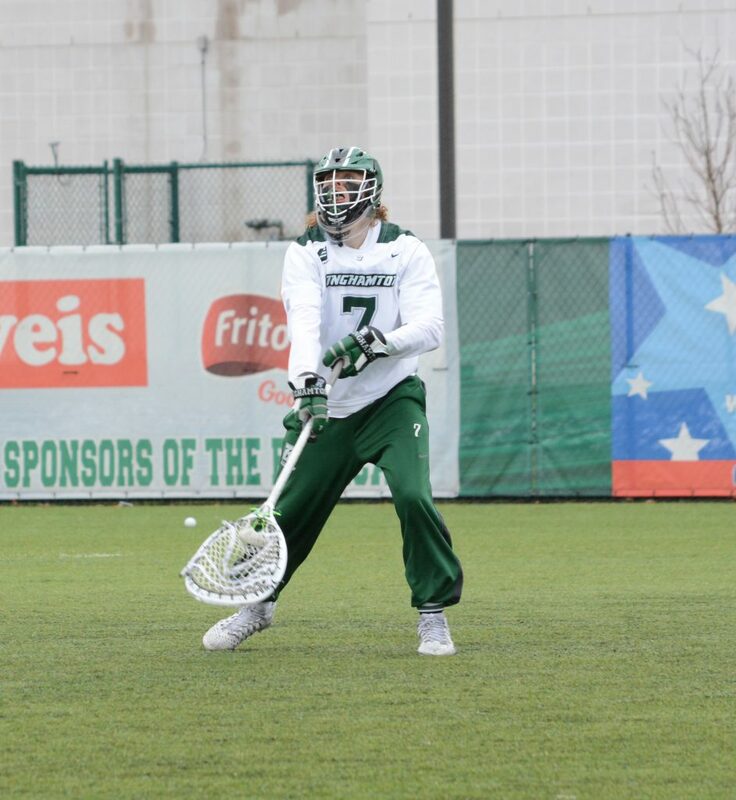 Coming in hot off its victory at Hartford last weekend, the Binghamton men’s lacrosse team took on UMBC this Saturday at home. The Bearcats (4-9, 1-3 America East) fell to the Retrievers, 5-2, at home despite the game taking place on the lacrosse team’s senior night, with the team celebrating its 10 graduating seniors just before opening faceoff. Of the seniors honored, midfielder Austin Macchi won seven of 11 faceoffs and attack Thomas McAndrew posted one dime on the day. BU took charge in the first period, scoring the first goal of the match with just over a minute played. Following this was an uneventful few minutes of play as both teams struggled to find the back of the net. With 2 1/2 minutes remaining, UMBC (4-7, 2-2 AE) scored to tie. Seconds later, Binghamton responded with a goal of its own, taking back control of the scoreboard. The period ended with a Bearcat lead of 2-1. UMBC had an early goal in the second period from junior midfielder Billy Nolan, once again tying the game. Both teams showed consistent ball movement throughout the period, but their defensive efforts were equally effective. Another score from UMBC freshman midfielder Michael Zichelli was the only other goal for the remainder of the period, and the scoreboard read 3-2 in favor of UMBC at the half. In period three, an energetic crowd became even more raucous as a penalty was called on Binghamton freshman defender Tom Galgano for unnecessary roughness. The two teams were battling hard during this period, and such a call seemed inevitable. Both teams ran up and down the field for all 15 minutes, but at the period’s conclusion, no additional goals were scored. Period four featured continued great defensive efforts from both teams, as it seemed almost impossible for either team to score. With just under five minutes remaining, UMBC freshman attack Brett Baucia provided his team with a goal, the first of the entire half. With 2 1/2 minutes left, the Retrievers called timeout. The break turned out to be beneficial to the Retrievers, as just over one minute later the team scored another goal. With 20 seconds left, the crowd let loose shouts of disappointment as a delay of game was called on BU senior midfielder Stephen Petrelli. The night ended in a victory for UMBC, and it left the field shouting with excitement. Redshirt senior attack Sean Gilroy led the Bearcats in scores with two. Macchi and freshman defender Kyle Tiernan picked up four ground balls each. The Bearcats are set to take on Albany this Friday. Faceoff is scheduled for 7 p.m. from the John Fallon Field in Albany, New York.